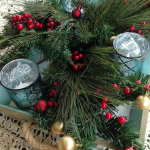 My Christmas wreath and garland is elegant, festive and magical. 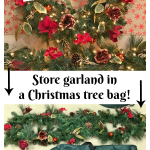 Yes, I’m a DIY blogger, but sometimes I prefer to leave it to the experts. 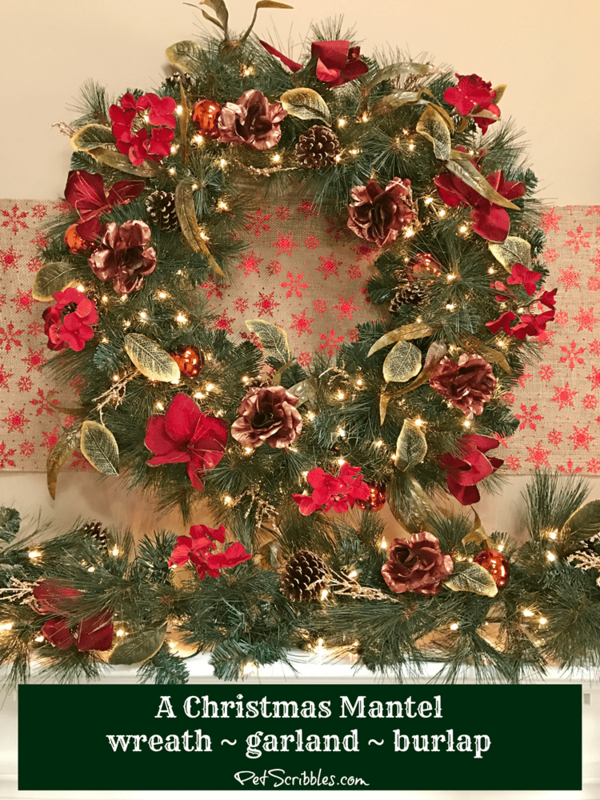 And that’s exactly what I did with this stunning wreath and garland! 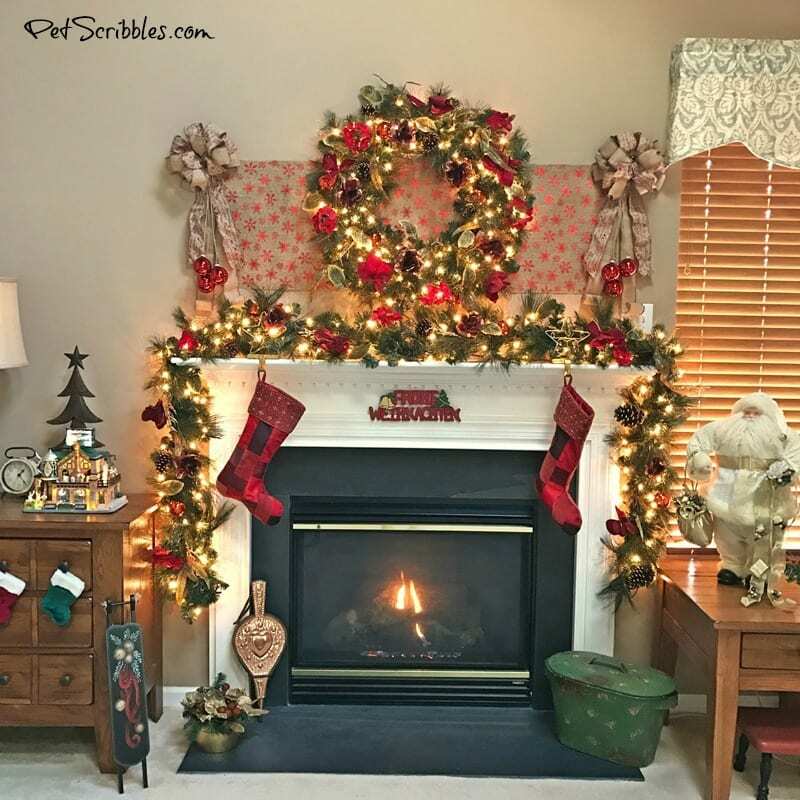 Ever since I was a little girl, Christmas with my family has always been a magical time. My parents are both 85 years young and this year I turned 50. That’s a lot of Christmases spent together, yet I still can’t wait to be with them for Christmas, it’s still so special every single year. 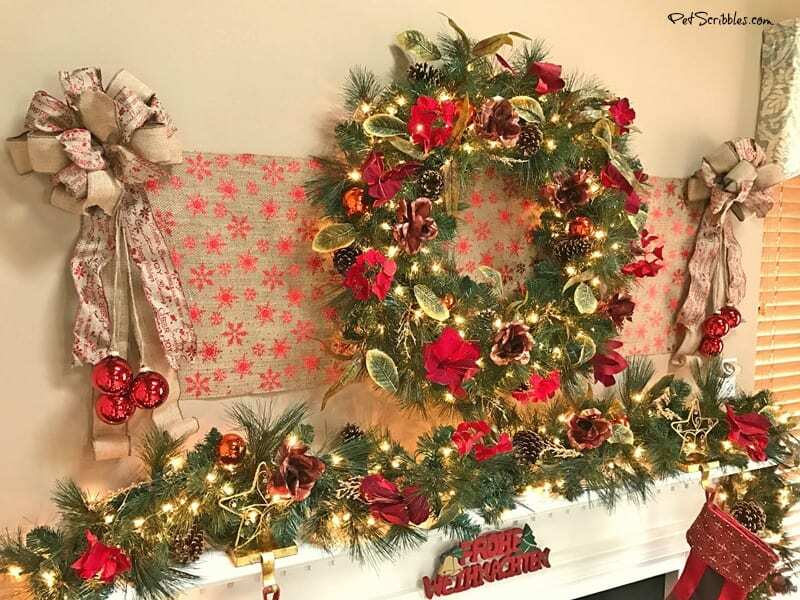 My mother loves to decorate for Christmas — always has — and that love definitely rubbed off on me. 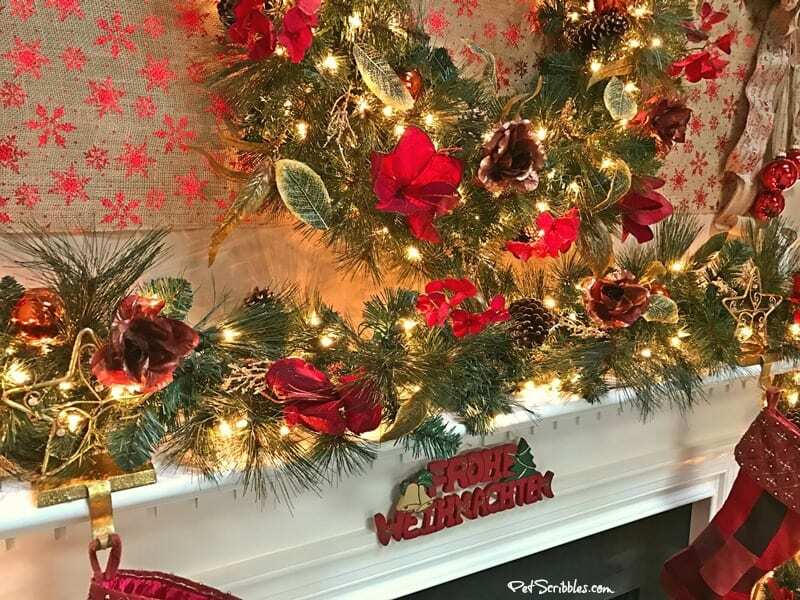 My mom pays attention to amazing little details you wouldn’t necessarily even think about, and the end result is a beautifully decorated home for Christmas that feels warm, welcoming and inviting. 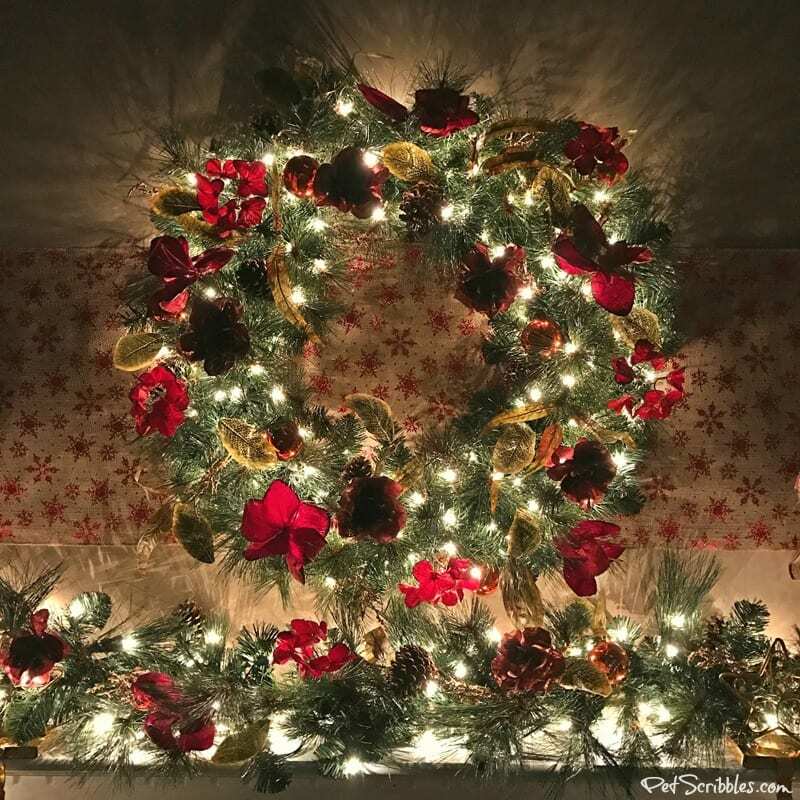 For my husband and I, this is our ninth year in our current home. 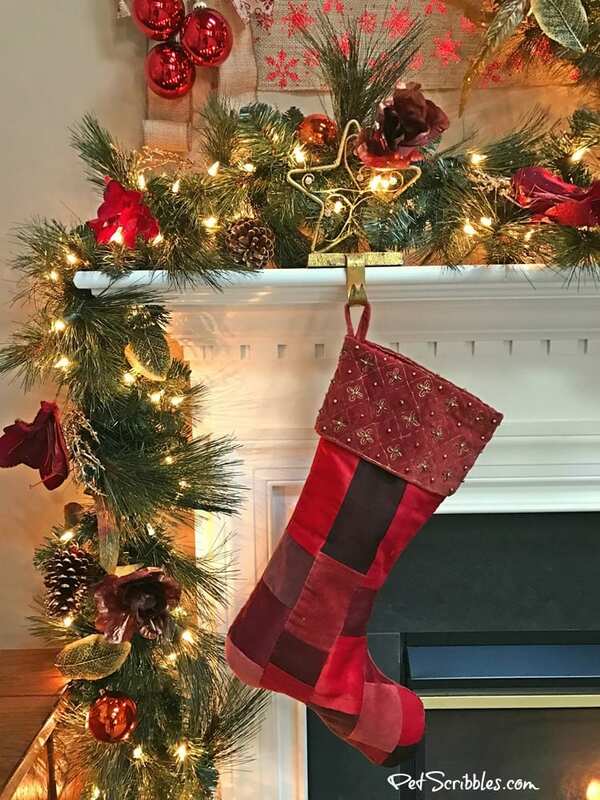 Each year we add just a little bit to our Christmas decorations. 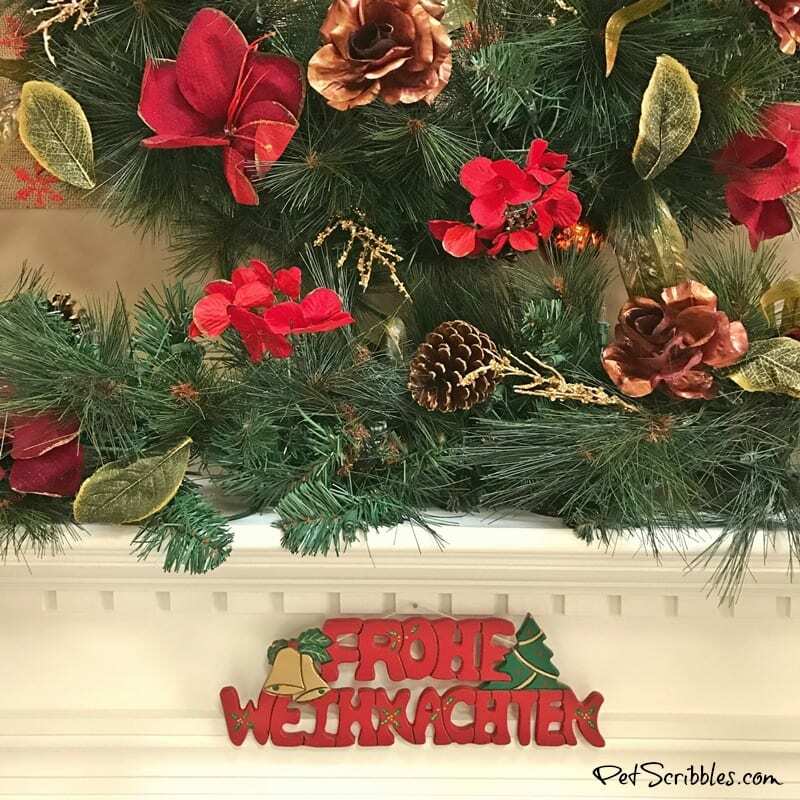 We’ve inherited several meaningful ornaments from our families — like the German Merry Christmas sign from my late father-in-law — so our style is definitely a mix of old and new with traditional Christmas colors. 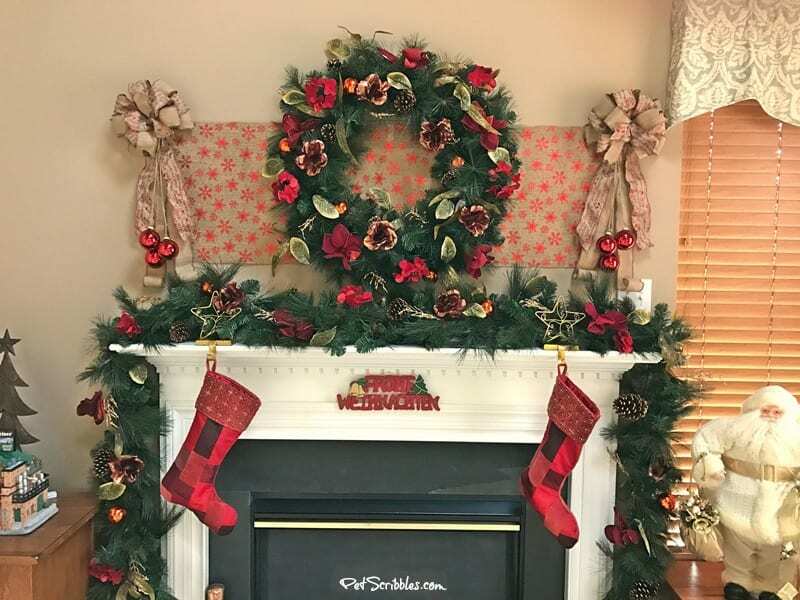 When I saw the Venetian Elegance wreath and garland on the Tree Classics website, I knew instantly this was the style for us. 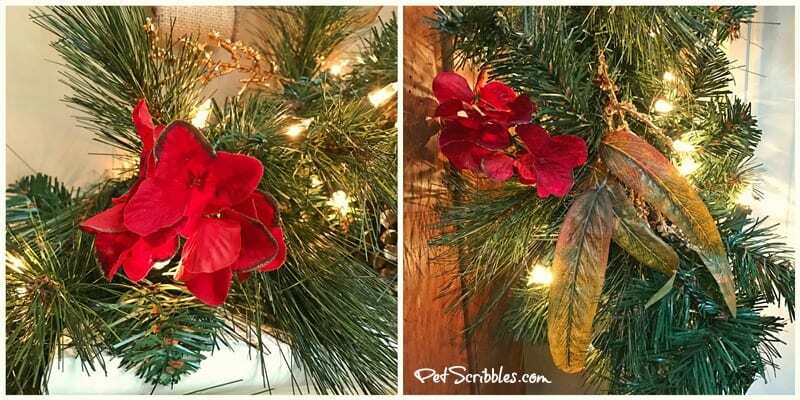 There are bronze-copper accents, gold-dusted Magnolia leaves, two different kinds of red flowers — one almost resembling hydrangea blossoms — and gold twigs. 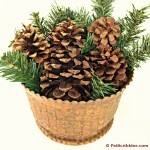 The gold-tipped pinecones are real, and the wreath and garland have both artificial and real pine needles. 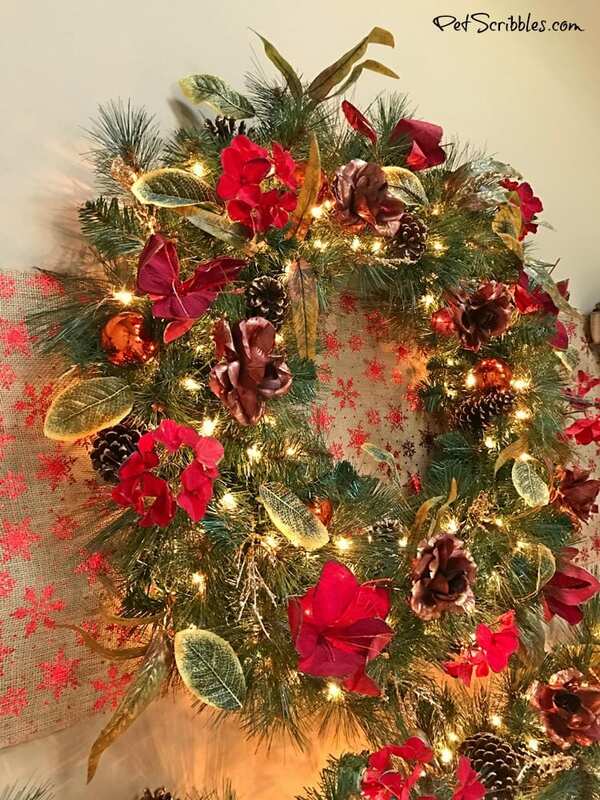 Everything is so lush and full, and looks so festive and elegant . . .
. . . and when the warm, white lights sparkle and shine, the wreath and garland take on an old-world magical feel. 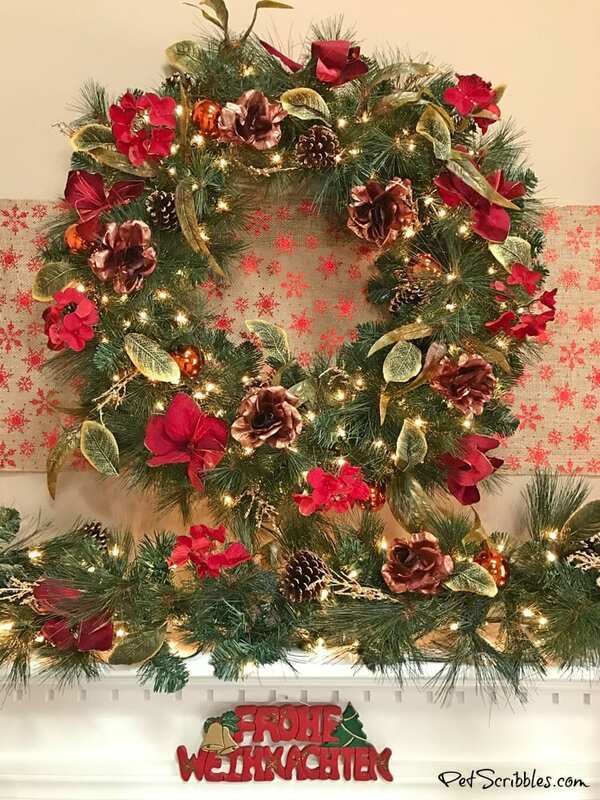 The wreath and garland remind me of the gorgeous holiday decorations in old Hollywood Christmas movies, or more recently on Downton Abbey. 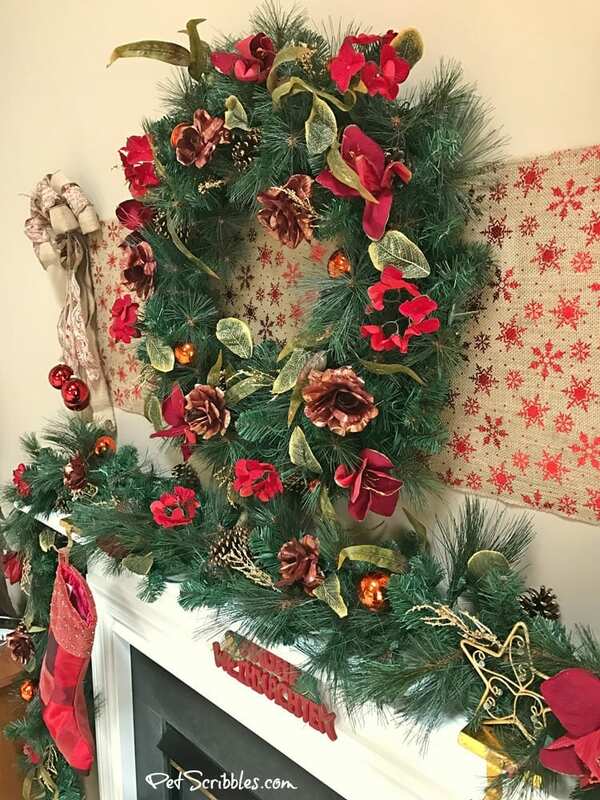 The only bit of DIY that I had to do with this wreath and garland was to fluff them up after taking them out of their shipping boxes. The fluffing does take some time, but it’s totally worth it. 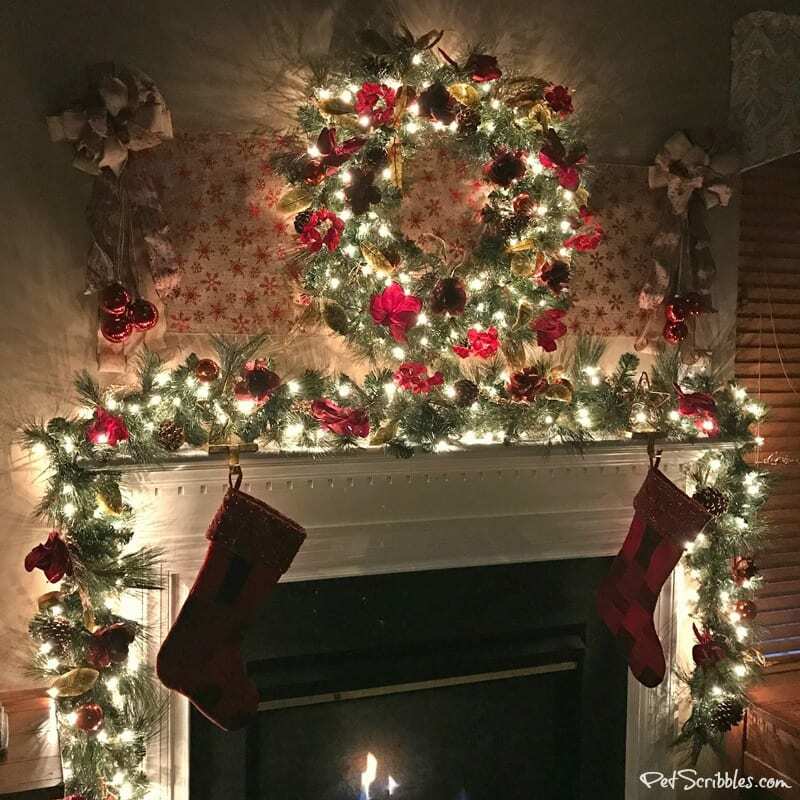 We hung printed burlap behind the wreath and extended it the length of the fireplace. 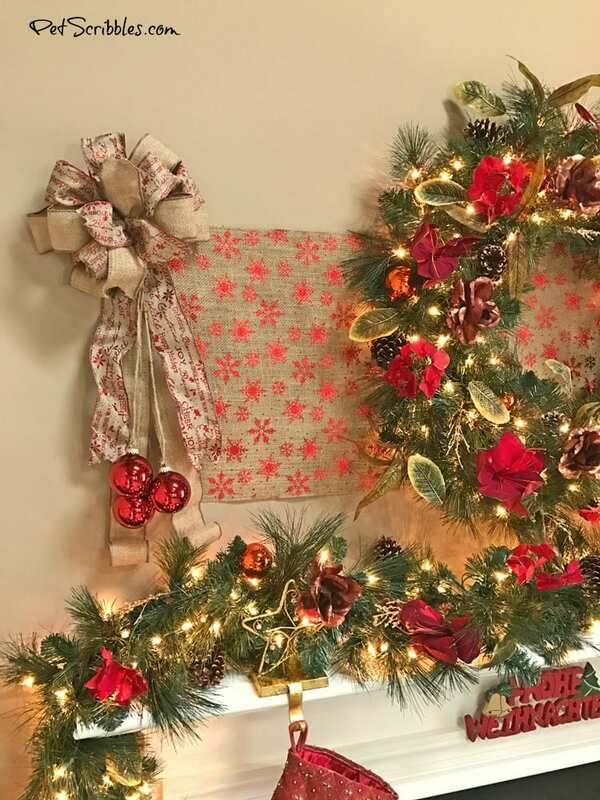 Two matching burlap bows anchor each side. 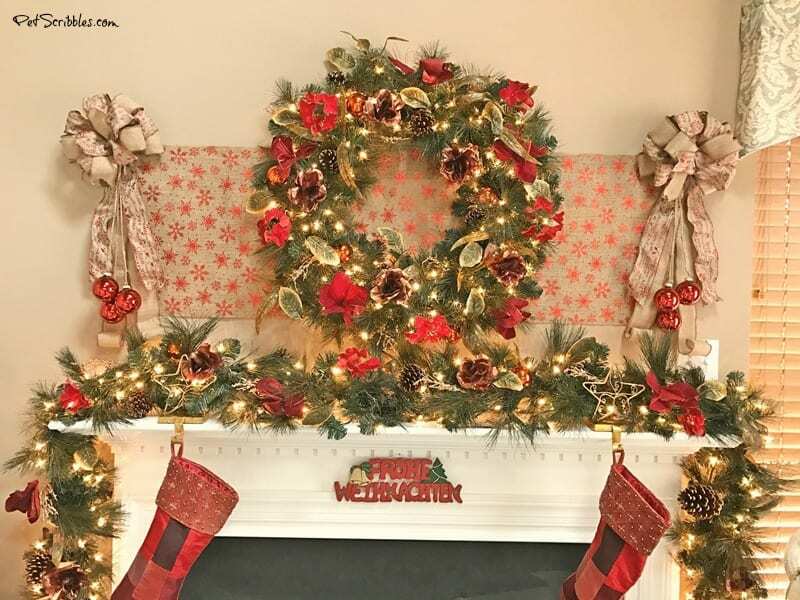 I attached red Christmas ball ornaments with jute twine onto each bow to mirror the ornament balls in the wreath and garland. 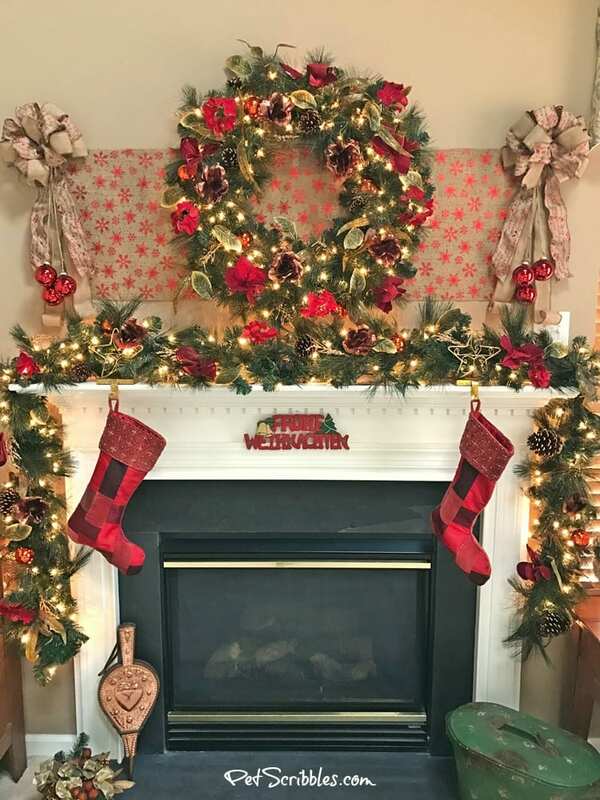 This Tree Classics Christmas wreath and garland have finally given our fireplace mantel the look we’ve always wanted! 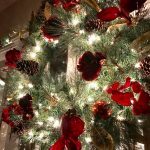 When we visit my parents at Christmas, I have my own little tradition: I slowly walk around the house and admire the Christmas decorations. I might even secretly take a few photos. 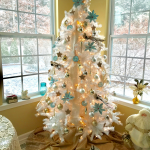 Looking at everything indoors and out at my parents house reminds me of my childhood, and of past Christmases. So I go back inside, find my parents and give each of them a huge hug of thanks! Very pretty. I like all the details, lights and ambiance. What an opulent mantelpiece! I’d say the fluffing was worth it, they are so FULL, great job!